“Come to Your Senses: Fun with Sensory and Beer Tasting”: An educational hour with Sensory Director Enid Lints. Sample beer and gain some knowledge to impress your friends! A bohemian lager brewed by the queens of Silver City Brewery, in celebration of the Pink Boots Society- an organization that assists, inspires, and encourages women in the beer industry- Royal Remedy is a blonde beer fermented with traditional bohemian lager yeast. It sings with aromatic hops that impart a citrus, tropical, and earthy floral character. Taproom Guest Appreciation Week // Daily Events & Specials! Join us for the 2019 Taproom Guest Appreciation Week, featuring a slew of exclusive events and specials to celebrate our supporters! $2 Pints* All Day Long! Special Cask Night: Margarita Beer! Join us at the TAPROOM for a special beer & oyster pairing Wednesday, April 17th, brought to you by Taylor Shellfish Farms. Food runs from 6pm-8pm. Casks tapped at 3pm. Featuring Ginger Lime Ziggy Zoggy Lager & Xtra-Hopped Mind Unwind IPA on CASK! $15 for a 1/2 dozen oysters. $25 for a full-dozen. Quantities limited-- while supplies last! Celebrate the return of beer-drinkin' weather with Muy Bueno Mexican-Style Lager. An all-around "very good" beer, Muy Bueno incorporates flaked corn in the mash to give it a well-rounded body and depth of flavor, with a subtle, but crisp Liberty hop finish. Crack one by the grill and serve it up with your favorite southwestern cuisine. Mind Unwind is a modern cover of a classic style, a heavily-hopped golden IPA incorporating six different experimental hop varieties for big juice flavor in a beer resembling traditional West Coast IPAs. Notice hints of citrus and white grape aroma and flavor within a notable, but nimble malt presence. Limited Bottle Release: Lost in the Riddle Tart IPA Miniseries. A mysterious new Tart IPA miniseries in four parts. Snag the first three on April 1st (no joke). Step into the void and be lost in the riddle. This delightfully esoteric IPA underwent an extended fermentation period on brettanomyces, creating a tacitly tart taste with subtle earthiness. Join us for a one-of-a-kind cask of Deluxe Malt Liquor, conditioned with oranges and mandarins— buy a pint, keep the glass (while supplies last). Throw back a throwback. This golden lager is crafted in the classic, American malt liquor tradition with the addition of flaked corn to the mash. With a depth of body unique amongst lagers and a slick, refreshing finish, it's the perfect fill-up after a day in the garage. Aged for two years in a barrel that once housed chardonnay; peaches, wheat, and the vanilla character of the oak are brought together by brettanomyces, lending a subtle tartness. Our featured cask will be "Tagalong-Inspired" Bourbon Barrel Aged Imperial Stout with Peanut Butter. We'll also have taster flights of with our beers, along with cookies suggested for pairing. Join us for the 9th Annual Washington Beer Open House! Why is it a “No Brainer”? Because it incorporates everything one could love about a pale ale. Bringing together the juciness of the New England IPA with the pristine body and crispness of a classic, West Coast style beer— No Brainer incorporates Mosiac hops, along with both of its genetic parents— Nugget and Simcoe— for sweet fruit flavors against a soft malt bill in a delightfully refreshing package. Seriously, it’s a no-brainer. In draft and 4-Packs of 16oz cans for the first time ever! lager with abundant herbal character from Czech Saaz hops. 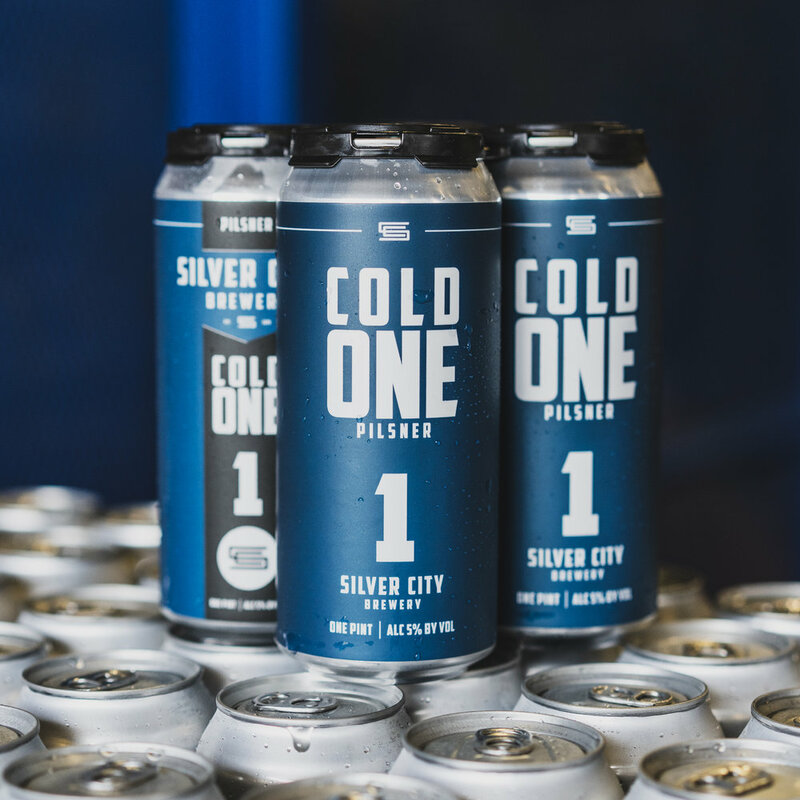 Cold One will be available in 16oz cans and limited draft! January 30th: We’re releasing our annual Valentines Series of barrel-aged beers— and we’re getting the party started with a beer & chocolate tasting at the #taproom! To celebrate, we'll be tapping a special cask of Sun Glitter on the release night! 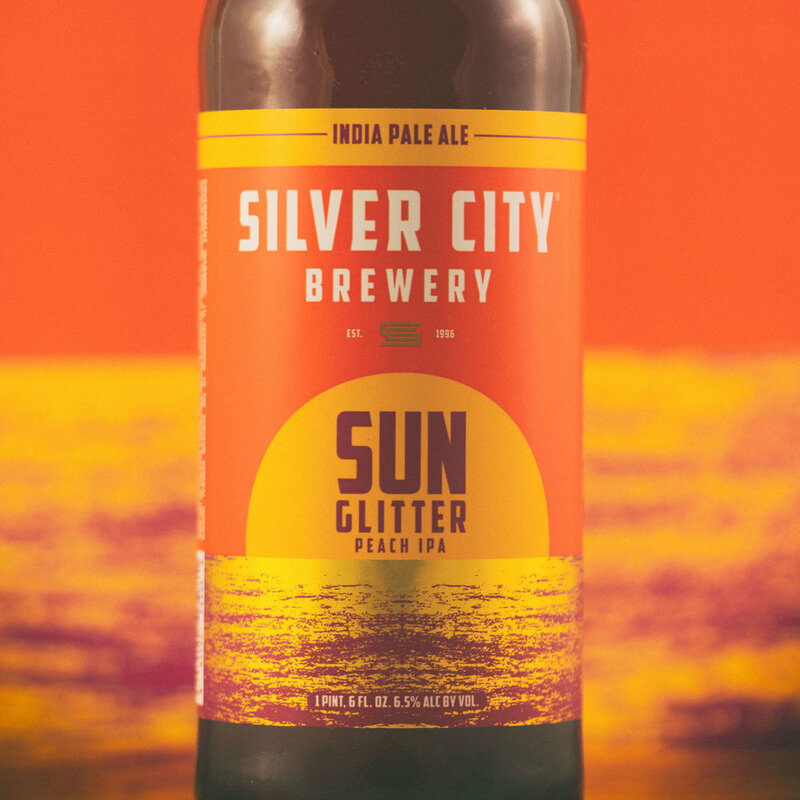 Sun Glitter Peach IPA will be available on tap and in 22oz bottles! During the Sun Glitter cask night, we will have have complimentary pizza for Secret Society members from Chico pizza, and an extra special exclusive cask of Sun Glitter Peach IPA infused with lime & coconut! Silver City Brewery Taproom will be closing early on this day for our annual staff Christmas party. Cheers! Join us on THANKSGIVING EVE for Growler Fills Starting at $5 ALL NIGHT LONG! Join us at the Taproom, Sunday, November 11th for a Veterans Day sale, with $2 select pints & 25% off bottles & cans. Limited Bottle Release October 11th! First thing's first, we've got to find a way-- to make the beauty of the night time last all day. A black beer for people who love intense roast character, The Darkness is “inspired” by the German Schwarzbier style, but fermented utilizing ‪Silver City Brewery‬'s house ale strain. This imparts a rich and smooth body, along with the roastiness, but in a 5% beer that can be enjoyed both day or night. Preorder yours today and receive it September 11th at our Oktoberfest Party! $20/Each, includes first fill of Oktoberfest Lager on pickup! The Charming Disarmer draws you with her sweet demeaner, but it's her wild side that captivates. Aged for two years in a barrel that once housed chardonnay; peaches, wheat, and the vanilla character of the oak are brought together by brettanomyces, lending a subtle tartness.